This made us instantly fall in love with him. McLean is a three time winner at the Evolution Championship Series, an annual esports event that focuses on fighting games. He won honors for being the best fighter in the games Injustice: Gods Among Us in 2014, Mortal Kombat X in 2015 and 2016 and Dragon Ball FighterZ in 2018. 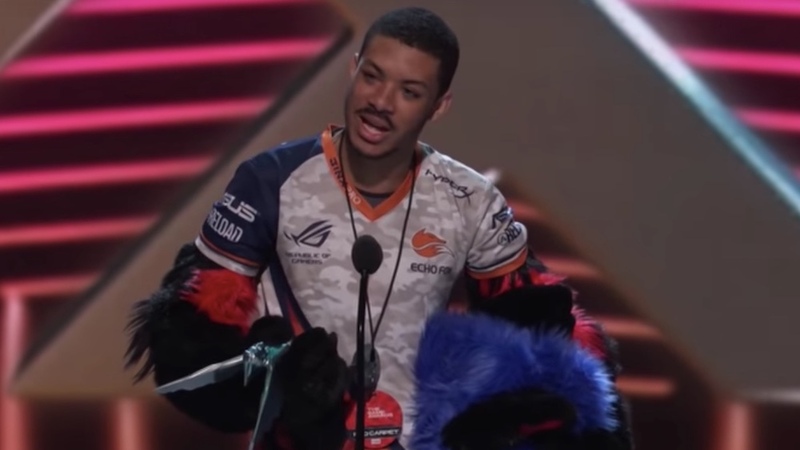 His being proudly gay, black and a furry all matter in the often toxic atmosphere of gaming. Just recently, the creators of the first person team shooter Fallout 76 had to ban players for homophobic assaults. Players in the game Red Dead Redemption 2 have made a game of assaulting and murdering feminist and black characters. McLean actually came out via Twitter in August, but his awards speech has helped make even more people aware of his unique and intersectional identity — score! He’s also a cutie, but he didn’t need to say that. It was evident the second he pulled off that costume head and showed his face. I loved that he affirmed being “super gay” too! And 2/3 of the comments are spam but of course Queerty wont let us report. Thanks for the comment, Larry. I try to delete them when I notice them, but I have alerted the management to see what we can do to block such spam comment posts. Daniel – ironically, one of those spam posts is right under yours. A ‘FURRY’ is anyone who is a member of a group of folks that dress in costumes that are of furry animals. I have a very good friend who is a member and he has a costume very much like his dog that passed away several years ago. They have conventions and parades. Yep. Go online and I think you will be able to check them out. I was thinking he was an otter. CNN’s This Is Life with Lisa Ling just did an entire episode of the Furry lifestyle a few weeks ago. Fascinating community that’s very accepting of others. You can probably find the episode online. This guy is a sweetheart! There is something seriously hot about nerdy guys like him. WOW! Just found a reason to take up gaming. This man is totally together in addition to being totally HOT! good on him. and us for playing on the same team.